US, 1951, 99 minutes, Black and white. Paul Douglas, Janet Leigh, Keenan Wynn, Donna Corcoran, Lewis Stone, Spring Byington, Bruce Bennett, Elly Corby. 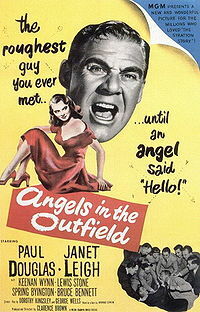 Angels in the Outfield is an enjoyable fantasy, especially for Americans who enjoy baseball. The film say it could be about any team throughout the United States but the screenplay focuses on the Pittsburgh Pirates (which were part-owned by Bing Crosby who has a momentary cameo in the film. Many comedies of the 1940s and 50s had angels in their screenplay. For Heaven’s Sake, with Clifton Webb and Edmund Gwenn as angels, appeared in the same year. This time the angels do not appear but their voices do. Speaking to Paul Douglas as the very gruff coach of the Pirates – and seen by a lit orphan, played by Donna Corcoran, from the orphanage of St Gabriel? where Spring Byington as superior and Ellen Corby is the class teacher. Paul Douglas does his usual gruff thing, mellowing, as the coach. A young Janet Leigh is an ambitious reporter. Keenan Wynn is an obnoxious radio and television commentator. The film is very much of the 1950s – and, when it was remade in 1994 with Danny Glover and Christopher Lloyd, the angels actually appeared but much of the dialogue from the old film, especially in the court before Judge Lewis Stone, about the existence of angels, was completely dropped. Interesting comparison between the different decades and religious attitudes and the popular imagination. The film was directed by Clarence Brown, veteran director of many MGM films including some for Greta Garbo, Queen Christina and popular films like National Velvet, the yearling and intruder in the dust. 1.A popular fantasy of the 1950s? Angels and humans? The possibilities of angels? 2.Black and white photography, the city of Pittsburgh? The baseball field? The apartments, the convent and the orphanage? A realistic setting for the fantasy? The musical score? 3.The title and expectations, audience knowledge of and liking for baseball? The team, the rules? The players? The cameos from Joe DiMaggio? and Ty Cobb? The cameos also from Harry Ruby, the composer of Three Little Words, and his comment about ‘Heaven help us’ for the team? The voice of James Whitmore as the angel? 4.The performance of the Pirates, their failures, the crowd laughing? Guffy and his anger, tantrums, the umpires, the crowds? Jennifer and her interest in him, her reaction to his swearing, her discussions with the editor, his commissioning her to write the articles? Her approach to Guffy in the restaurant, commenting about ketchup on the steak, his writing the note, ‘Boo’? 5.Guffy and his losing his lucky charm, on the field at night, hearing the angels, the discussion with the angels? His being a changed man, his calmness, being pleasant? The threats from Fred Bayles and his losing his temper and punching him? The deal with the angels? 6.The angels, the voice? The former baseballers playing in the team and the film’s tribute to the baseballers, especially at the end? The joke at the end hearing their voices as they played on the field? 7.The improvement in the team? The victories? Guffy’s behaviour? Fred Bayles and his anger, comments? His punching Guffy? 8.The sisters and the orphans, Bridget and her seeing the angels, their thinking she had sunstroke? The reports about angels? The newspaper articles? Guffy going to see her, befriending her, discussions with the nuns, the possibility of adoption? Jennifer and her going to see Bridget after she wrote the article? Her getting to know Guffy, friendly, falling in love? The possibilities of marriage and adoption? 9.The build-up to the climax, the possibility of winning the competition? Guffy and the angels calling off the deal after his loss of temper? His being called before the judge? 10.The discussions with the judge, Fred Bayles with the prosecutor? The discussion about angels, metaphysics, religion, church? The evidence of the minister, the rabbi and the priest? Their quoting the texts? Appealing to people’s faith? The contrast with the psychiatrist and his testimony and offering to see Guffy in his rooms? The ministers offering to see the psychiatrist in their rooms? Hurrying away for the match? 11.The various members of the team, playing practical jokes with tough steak on Guffy? Saul Hellman and his being the veteran, former friend, subject of Guffy’s tantrums? His dying and the angels saying he would be with their team? The final match, Guffy having faith in him, going out to him? His success in winning the match? 12.Sister Edwitha, with the orphans, her knowledge about baseball? The reaction to the reporters? With Bridget? Her advice to Guffy? Sister Veronica and her being agreeable? 13.The build-up to the finale, the possibility for Bridget to be adopted? Jennifer and Guffy together – the tribute to the baseballers and to family values?